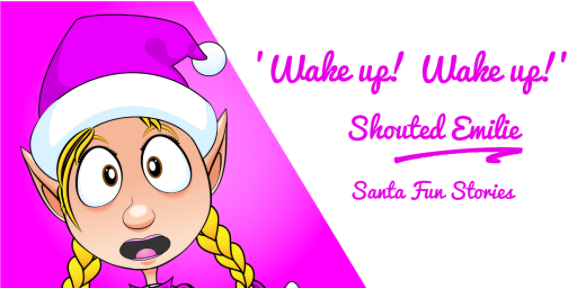 And if that’s not enough for you, read on to find out what happens in the newest edition of Santa Fun Stories’! The weeks leading up to Christmas were always very busy, and Santa would always be grateful for any extra help. 'Wake up! Wake up!' shouted Emilie, running across Ollie’s bedroom and jumping straight onto his bed. 'What? What?' said a half a sleep Ollie, sitting upright from his sleep. ‘What’s happening?' as he peered around his room all confused, wondering what was happening. 'Oh you are funny, it’s me, Emilie!' Emilie laughed, as she was shaking him, trying to wake him up. 'You girls can be so annoying...' said a sleepy Ollie, as he was trying to lay down and go back to sleep. Ollie’s eye’s opened wide, as he remembered that all his friends were coming to see him. Within a minute he was washed, dressed and running down the stairs to eat his breakfast. ‘This has to be the most exciting day,' said Ollie, eating his breakfast in big spoonfuls. Every year just before the big rush for Christmas, Santa’s elves would gather from all over the North Pole and come together to give Santa a helping hand. 'Come on Emilie, run faster!' shouted Ollie, as they ran over to the workshop. All of a sudden a layer of magical stardust, had sprinkled over the two of them. All of sudden, Ollie and Emilie came down with a big bump and found themselves strapped and sitting in the Christmas capsule, that was flying towards Santa’s workshop. As Ollie and Emilie turned around, the magical capsule was full of all their friends from around the North Pole. 'Oh Ollie, that would be just perfect,' said all his friends. On top of the workshop roof, were two very large secret doors, that opened up towards the midnight sky. As the doors opened up, magical stardust burst into the sky, making a pathway for the Christmas capsule to land. 'Oh this is so magical,' said Emilie as they flew through the stardust and into the workshop. 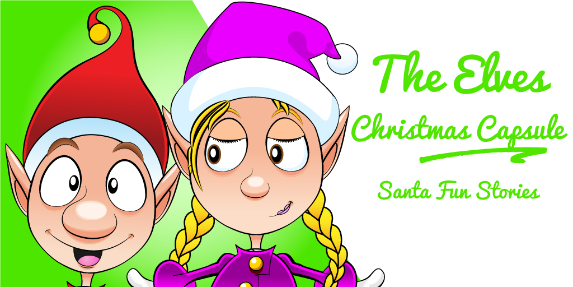 As the capsule landed, a big puff of stardust pulled the doors closed, and out stepped Ollie and Emilie leading out the army of Santa’s helpers behind them, ready to get started. ​Have you seen all the snow laying around out here? And what about those targets that keep popping out from behind those trees? It’s about time we put those targets and this to good use! Use all the snowballs we’ve made for you and see how many of the targets you can hit! Everyone was woken up very early, wondering what Ollie was laughing at so much when there wasn’t anything to be seen. Why was Ollie giggling so much? 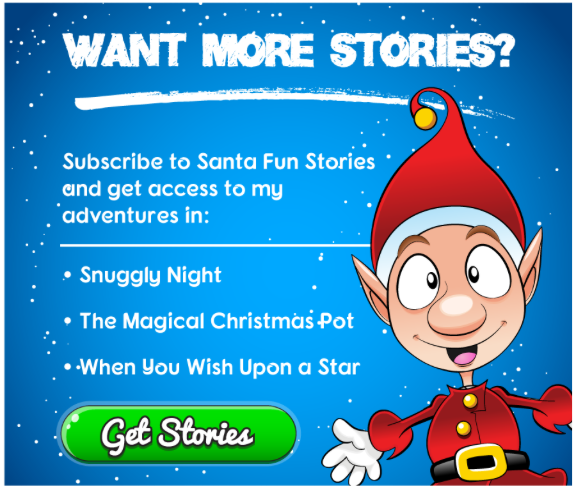 Read on to find out what happens in the newest edition of Santa Fun Stories’! 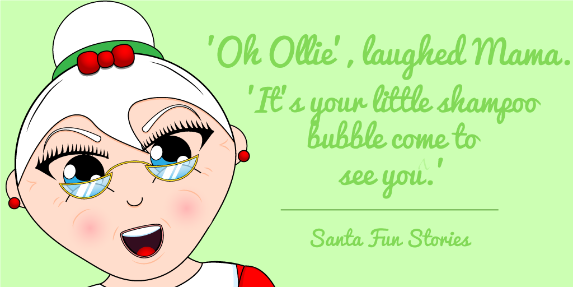 'Good morning little Ollie Pops,' said Santa, as he walked into Ollie’s nursery to see what all the noise was about. Ollie had woken up very early and was sitting in his cot laughing so loud, that he had woken everyone up. Ollie Pops was snuggled all cosy under his teddy bear blanket. 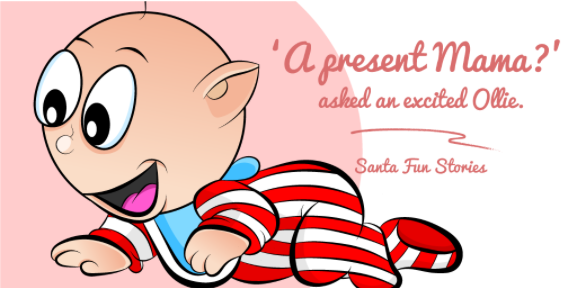 Santa watched, every time Ollie peeped under the blanket, Ollie went into fits of laughter. 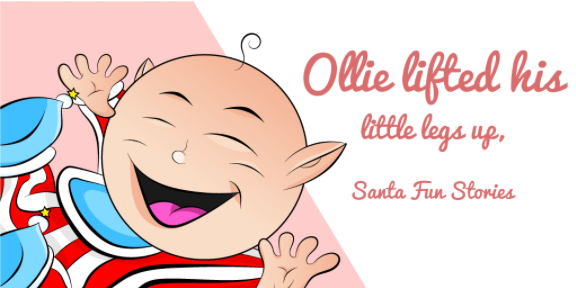 As Ollie continued to peep under his blanket, he would roll onto his back kicking his little lags in the air with laughter. 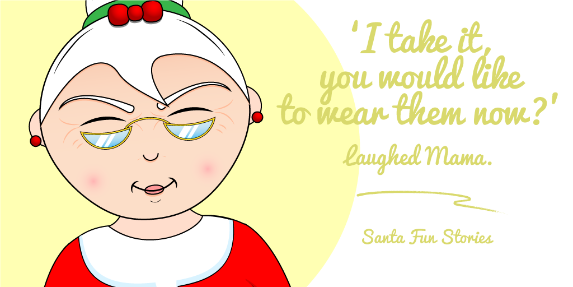 Santa looked at Mama shrugging his shoulders, not knowing what was making Ollie laugh so much. As Santa and Mama peeped under Ollie's blanket, there was nothing to be seen, only his two little stripy bed socks that he had kicked off in the night. Ollie sat up and peeped under the blanket once again. Straight away Ollie went into fits of laughter, looking at Santa and Mama and pointing under his blanket. 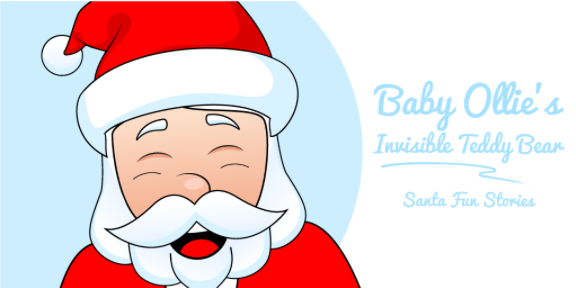 As Santa and Mama peeped under his blanket, once again there was still nothing to be seen. Hiding under his blanket was Ollie’s special little friend. His name was Ted and he was the cutest, fluffiest, teddy bear. He had been playing peek a boo with Ollie and pulling lots of funny faces, making Ollie laugh. Ted was a very special and magical teddy bear to Ollie, as they had known each other since Ollie had been born. 'Oh you are so funny,' said Ollie. With that, Ollie and Ted went into fits of laughing once again. Santa has a very long journey coming up soon. He’s got to set out and deliver all the presents to the good boys and girls around the world! The Elves have decided that we need to help him, and collect lots of cookies for him, so he doesn’t get hungry on his journey. You can’t fly around the world on an empty stomach! 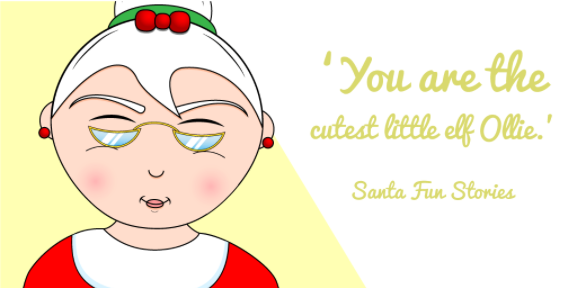 Will you help collect the cookies for Santa? Ollie is so excited when his magical hair bubble comes to visit him leaving him a bathroom full of magical surprises. Every sunday evening just before Ollie’s bath time, he would get very excited, as he knew his little shampoo bubble would come to visit him while he was in the bath. As Ollie sat playing in the bath with all his toys, the little hair bubble would float down, and sit itself over Ollie’s little curl. ‘Mama!' said an excited Ollie, pointing up towards the floating bubble, while his little feet splashing with excitement. As the shampoo bubble placed itself on the top of Ollie’s head, it covered his one little brown curl, ready for it’s wash.
As Ollie sat and splashed around in the bath, the magical shampoo bubble would get to work, shampooing and cleaning Ollie’s little curl. 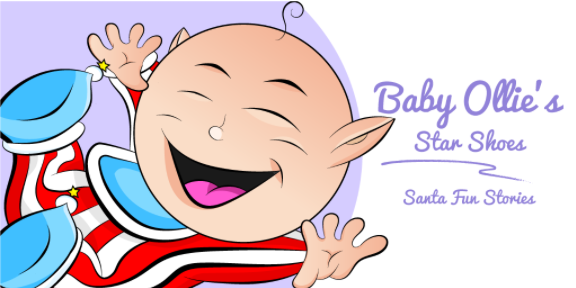 Ollie would get very ticklish as the bubble would start to spin, filling itself with baby shampoo and tiny little bubbles, making Ollie’s little curl super clean. 'Mama, look!' said Ollie looking up towards the ceiling. There were little bubbles everywhere. The more the magical bubble turned around, cleaning Ollie’s hair, the more bubbles would start to appear. Eventually they were filling the bathroom with tiny bubbles. 'I made one wish Mama,' giggled Ollie with his eyes tightly shut. 'What’s your wish Ollie?' 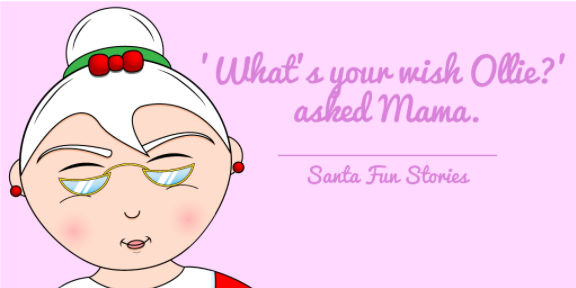 asked Mama. 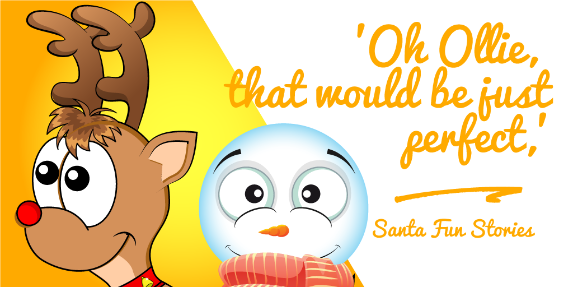 ​Santa and his friends have been having some trouble landing the marshmallows in their hot chocolates! Do you think you can help them out? You’ll need to time it just right, and make a big splash into the hot chocolate! 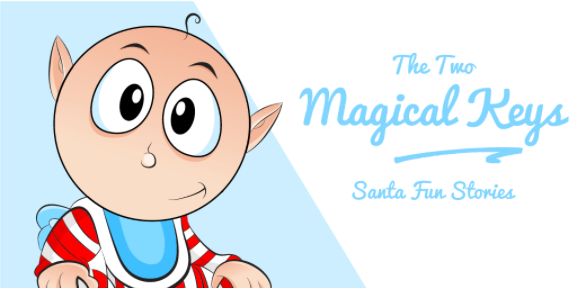 Download Santa Fun & Games Workshop, and help them out! This week, Mama continues telling Ollie Pops the story of the two little magical keys, after he fell asleep before Mama could finish last week. What will happen in the story, and what are these two magical keys for? 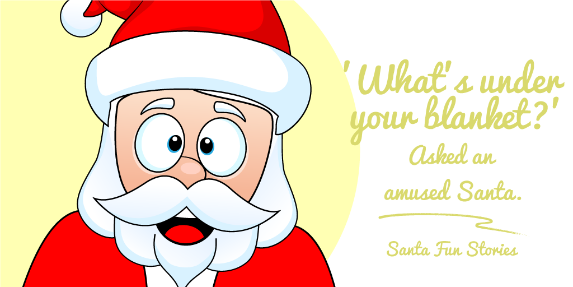 Read on to find out in the newest edition of Santa Fun Stories’! ‘Yep!’ Ollie said while nodding his head, giving a big yawn and stretching his arms above his head. Just before Ollie had fallen asleep, Mama had given him a beautiful present. They were the tiniest little pair of magical shoes. ‘Would you like me to start the story once again, now you are awake?’ asked Mama. Ollie nodded his head and snuggled back under the covers, to listen to his story. 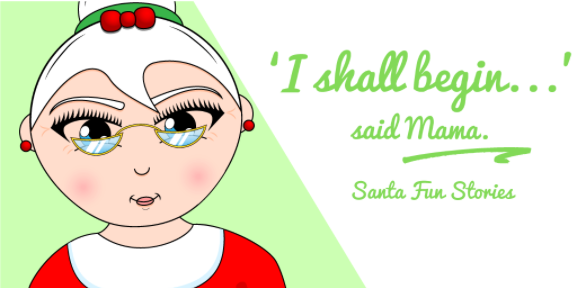 ‘I shall begin...’ said Mama. 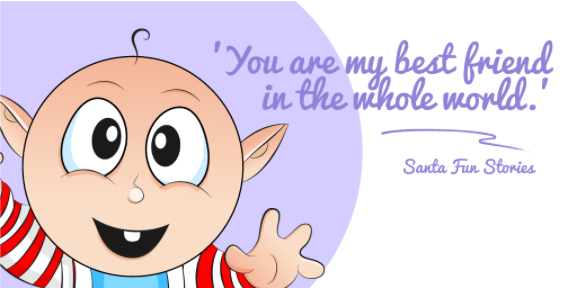 Once upon a time, there was a little baby elf called Ollie Pops. One day, Mama gave Ollie Pops a very special present. This was no ordinary present, but a very magical present. As Mama helped Ollie Pops open the little white box that was decorated in shiny stars, he saw the tiniest little pair of shoes. Ollie’s little shoes were very colourful. They were made of yellow, red and blue material and covered in little shiny stars. Ollie was so excited, he rolled onto his back and stuck his little feet into the air for Mama to put them on him. Attached to the ends of each of Ollie’s shoes, were two very special stars that turned around. These two stars were very magical and as they turned, they would reflect beautiful colours of the rainbow where ever Ollie went. Every morning, Ollie would sit comfortably in his little rocking chair next to his window. His little legs would be stretched out and his shoes facing out towards the window. He would love nothing more than to watch all the colours of the rainbow, reflect from his shoes over all the beautiful mountains. As the colours swirled around the white snowy mountains, Ollie would watch, as all the animals would gather together and move towards the rainbow colours, which were coming from Ollie’s bedroom window. As they reached Ollies window, they would all say a special good morning to Ollie Pops and blow kisses to him through the window. Everybody loved baby Ollie Pops. ‘Good morning little Ollie Pops,’ said Charlie the Squirrel, jumping through Ollie's bedroom window wiggling his brown bushy tail. Ollie lifted his little legs up, and stuck his shoes out, so Charlie could remove the magical keys from Ollie’s shoes. Under each of the moving stars were two little silver keys. Ollie Pops started to get very excited, as he watched all the animals follow Charlie the Squirrel to the two magical doors, just outside his window. As the big doors opened, Ollie watched, as the most beautiful white horses and very large carriages flew out of the workshop and lined up in front of all the animals. One by one the animals climbed onto the beautiful white carriages and were flown high around the North Pole, giving them all a magical treat. As Ollie waved and to all his lovely friends, he would snuggle down under his blanket and fall fast asleep for his little morning nap. Have you seen all of the pictures you have to colour in? There’s loads! Ollie absolutely loves colouring up in the North Pole. He’d love to see some of the pictures you’ve coloured in too! Why don’t you send him some? 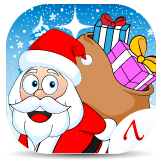 Download Santa Fun & Games Workshop and start colouring! Mama has a special present for little baby Ollie today. 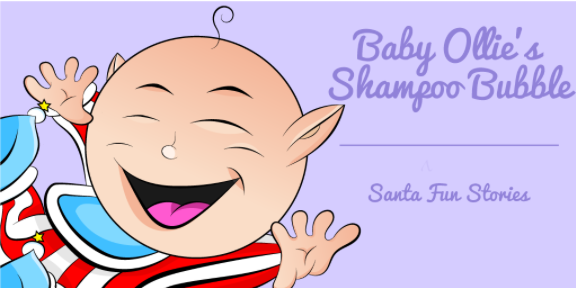 Although before he can get his special present, he must first get washed and dressed like a good little elf, once he wakes up from his lovely sleep. ‘Good morning Ollie Pops! How are you this morning?’ asked Mama as she entered Ollie’s bedroom. Ollie was just waking up from his sleep, where he had been dreaming about all the fun things in his little life. ‘A present Mama?’ asked an excited Ollie. Ollie Pops started to bounce up and down on his bottom, he was so excited. Mama lifted Ollie out of his cot and quickly got him washed and dressed. 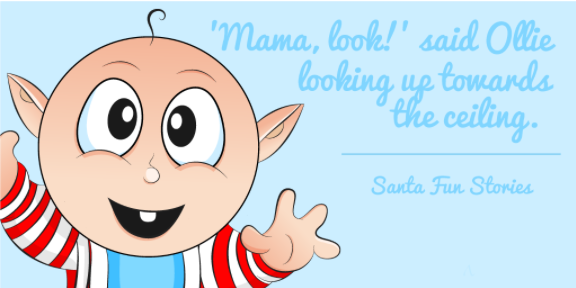 ‘Here you are Ollie,’ said Mama as she gave him a little white box, decorated with shiny stars. As Mama helped Ollie open the little box he saw the most tiniest little pair of shoes. Ollie’s little shoes were very colourful. They were made of yellow, red and blue material and covered in little shiny stars. Ollie was so excited, he rolled onto his back and stuck his little feet into the air. ‘I take it, you would you like to wear them now?’ laughed Mama. Attached to the ends of each of Ollie’s little shoes, were two very special stars that turned around. These two stars were very magical and would reflect beautiful colours of the rainbow all around Ollie’s bedroom. ‘Yes please!’ said Ollie Pops. As Mama started to tell Ollie the story of the magical keys, she noticed he had fallen fast asleep in her arms. All the excitement had worn little Ollie out. 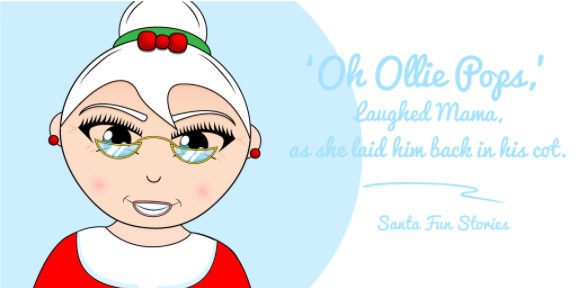 ‘Oh Ollie Pops,’ laughed Mama, as she laid him back in his cot. Santa could do with some help decorating his house for Christmas this year, and he’s looking for the perfect person. Is that you? 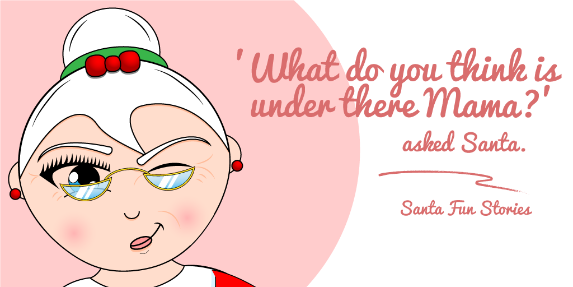 Think you could help Santa get it all finished before Christmas? 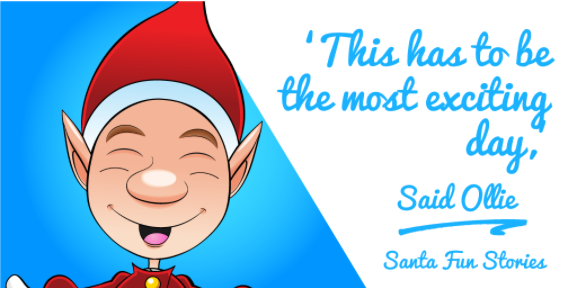 Download Santa’s Fun & Games Workshop, and get helping! Have You Seen Ollie's Gloves?